Sage Music owner, Jason Sagebiel, will conduct the NYC Guitar Orchestra for a concert of new works written exclusively for the orchestra at the LIC Arts Open festival. The New York City Guitar Orchestra is a performing collective that unites all levels of musicians with a passion for the distinguished heritage of the classical canon. 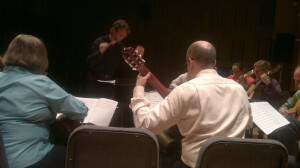 The Orchestra was established in 2010 by the New York Classical Guitar Society. It is a welcoming and professionally-run organization dedicated to providing valuable ensemble experience for guitarists of diverse backgrounds, while maintaining musical excellence and a commitment to fostering the creation of new music. Guitarists in the Orchestra celebrate the instrument’s vibrant history while remaining progressive and contemporary through exploring classical music’s melding with other genres and styles. Through its New Music Project—made possible by the generous support of The Augustine Foundation—the Orchestra has commissioned new works by a wonderfully eclectic roster of respected musicians. Among the commissioned composers are such diverse artists as Emmy-winning composer/guitarist/lutenist Frederic Hand, and B-52s’ member Pat Irwin. Next season the Orchestra will commission works from innovative microtonal composer and MacArthur Fellow John Eaton and the Grammy-winning artist Andrew York. The Orchestra is currently directed by Jason Sagebiel, a critically acclaimed artist and educator. The New York City Guitar Orchestra director Jason Sagebiel has been featured on the WNYC radio program “SoundCheck” and KUHA radio’s “The Front Row.” He has performed at esteemed venues such as Carnegie Hall, Merkin Hall, and Elebash Hall, and at prestigious festivals such as the Princeton Festival, the Van Der Stucken Festival, and the Warebrook New Music Festival. His compositions have been performed across the US by the ALIAS Chamber Ensemble, the Second Instrumental Unit, the Cygnus Ensemble, and the Louisiana Philharmonic Orchestra’s String Quartet. Pat Irwin is a composer and LIC resident. His credits include writing for HBO, collaborations with Philip Glass, and playing guitar with the B-52s, the Raybeats, and Eight-Eyed Spy. Josh Eustis has been composing mostly electronic music for the past 15 years, mostly under the name Telefon Tel Aviv, in partnership with the late Charles Cooper, III. He studied composition and theory at Loyola University New Orleans, with a focus in classical guitar, and has continued to compose music of some sort ever since finishing in 1999. He now tours as a member of Nine Inch Nails while continuing to work on solo material whenever time permits and video games get boring. Eustis’s “How Slowly, All of a Sudden” was the answer to Maestro Sagebiel’s challenge of composing a piece for a chamber orchestra of guitar players – something Eustis has never done before, and struggled desperately to accomplish. The inspiration for the piece was drawn from random written memories of his mother and grandmother, and an early cassette recording that he made, at age 3, at his younger sister’s christening. The New York Classical Guitar Society celebrate the remarkable range of music that has emerged from the instrument’s central tradition. The Society draws on its vast resources — an Advisory Board of world-class artists, New York’s wonderful guitar community, and the cooperation of performers from around the world — to provide both our membership and the guitar-loving public with an exceptional experience.